NC State’s football team has opened the season with three consecutive sellouts at home, including next Saturday’s contest against Georgia Tech, and only a limited number of tickets are remaining for the Pack’s game versus Central Michigan on October 8. That game is designated as “Bowl Day,” as State’s past bowl MVPs will be honored at halftime and bowl trophies will be on display for fans to take photos with. 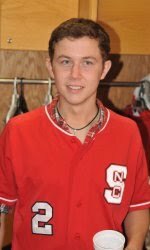 In addition, Garner native and American Idol winner Scotty McCreery will perform the national anthem prior to the game. The McCreery family holds season tickets for Wolfpack football. Remaining tickets are $39 each and can be purchased online be clicking here. Dont forget to vote and request. Just a reminder to visit the voting and requesting pages, to cast your votes for Scotty.. We've added a HOP IT OR DROP it to the Radio requesting page. So please check it out and head over to that station and leave a comment to "Hop" it. http://radio-locator.com/cgi-bin/locate?se...p;x=14&y=12<-- Locate your local station and Request. http://www.thebigtimeonline.com/e_quest_form.cfm <-- put in your station and it will request to that station for you. From Great American Country Forums. These are a list of large country stations. List below the GAC forum link. http://boards.gactv.com/eve/forums/a/tpc/f/7771090334/m/9523980637#.TmatQ_QhJGs.email <--GAC forums, if you're interested. Always request from your local station. If you listen online to other stations, and the DJ's take out of area requests then thats okay too. Between September 10th through now, five Idol singles landed at #1 on the Billboard music charts. Season 4’s Carrie Underwood is continuing to impact the charts with her duet, “Remind Me,” with Brad Paisley. The song landed at #1 on the Hot Country Songs and the Hot Country Songs Detections charts for the week of September 10th. Brad and Carrie will team up once again on November 9th when they co-host “The 45th Annual CMA Awards” live from Nashville’s Bridgestone Arena. This year’s show marks the fourth year that the duo has co-hosted the show together. Reigning American Idol Scotty McCreery makes his second #1 appearance on the charts with his latest single, “The Trouble With Girls,” which arrived on the Bubbling Under the Hot 100 chart on September 17th. Scotty is sure to have more hits in his future, as he’s releasing his debut album, Clear As Day, on October 4th.